Czech or foreign investors entering the Czech market may choose between several corporate forms. The fundamental law in this area is the Civil Code and Business Corporations Act. There are no limitations for foreign investors when it comes to setting up companies. A foreign natural or legal person may establish any form of company either together with other foreign or Czech persons, or alone as a sole shareholder. In this respect, foreign natural and legal persons enjoy the same rights and bear the same obligations as Czech persons and may not be discriminated against. A General Partnership is a company in which at least two persons carry out business activities under a common business name and bear joint and several liabilities for the obligations of the partnership with all their property. There is no requirement of a minimum registered capital, nor for the minimal contribution. A company in which one or more partners are liable for the partnership’s liabilities up to the amount of their unpaid contributions (limited partners), and one or more partners are liable for the partnership’s liabilities with their entire property (general partners). The minimum contribution of the limited partner should be set in the Articles of Association. Again, there is no requirement of a minimum registered capital. This is the most common form of doing business in the Czech Republic. The company exists independently of its members and it may be established either by one person, a natural or legal person, or by two or more persons (the maximum number of persons is not set). According to the Business Corporations Act, the minimum contribution of each shareholder is in the amount of CZK 1. 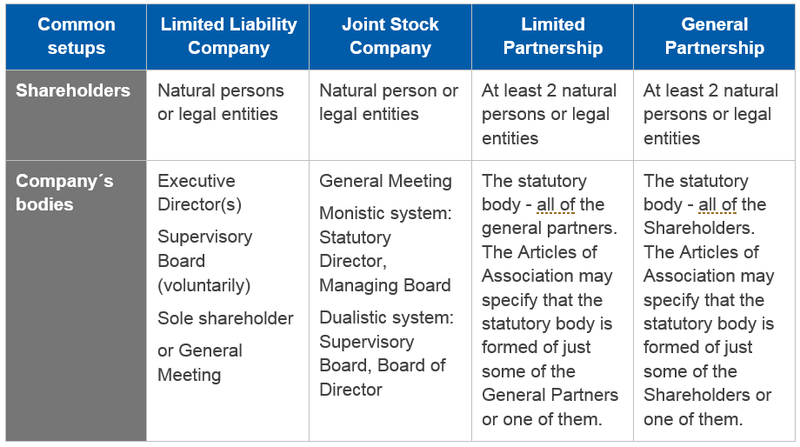 The minimum registered capital is not set in the legislation, so it is derived from the amount of minimum contribution of a shareholder (for a Limited Liability Company with one shareholder the minimum registered capital is CZK 1). A Limited Liability Company is liable for the breach of its obligations with all its assets, while shareholders guarantee for the breach of the obligations of the Limited Liability Company only up to their committed but unpaid contributions to the registered capital registered with the Commercial Register. The company may be established even by a sole founder. A Joint-Stock Company may be formed by a private agreement to subscribe for all shares, or by a public call for the subscription of shares. The minimum registered capital required is CZK 2,000,000 or EUR 80,000. The purpose of a Cooperative is to undertake business activities or to ensure the economic and social or other benefits of its members. A Cooperative is a community of an indefinite number of persons but it shall have at least 3 members. The Business Corporations Act does not set out the amount of minimum registered capital or minimum contribution. Foreign companies may conduct business in the Czech Republic provided that they have their business or branch offices located in the Czech Republic, registered with the Czech Commercial Register. No minimum registered capital or contribution is required. The most important document required when establishing a company in the Czech Republic is the Articles of Association / Foundation Deed. When the establishing company is a capital company (Limited Liability Company or Joint Stock Company) the document must be made in the form of notarial deed. a consent with the placement of a registered office / lease agreement (from office landlord) etc. Incorporation time varies based on company type. For example: the establishment of a capital company could be finished in 10 working days, while the establishment of a partnership is generally less time consuming and it could be completed in 5 working days. Foreigners who will form the statutory body have to prove their moral integrity by obtaining and submitting the criminal background check from the state of citizenship or long – term residency. If the shareholder should be a legal person, the proof of its existence (excerpt from commercial register) shall be required. Both corporate tax residents and tax non-residents are subject to Czech corporate income taxes. A corporation is a tax resident if it is incorporated or managed and controlled in the Czech Republic. Tax residents are taxed on their worldwide income while tax non-residents only on the Czech-source income. The taxable income is calculated on the basis of the accounting profits. As a general rule, expenses incurred on obtaining, ensuring and maintaining the taxable income are fully tax deductible, unless they are listed as tax non-deductible items. Corporate income tax is levied at a general (standard) rate of 19%. Moreover, lowered corporate income tax rate of 5% applies to basic investment funds while pension funds are subject to a corporate income tax rate of 0%. The tax period may be a calendar year or a fiscal year. The taxpayer has the obligation to calculate the tax due in the corporate income tax return (self-assessment). The time-limit is thee or six months depending on certain conditions. Advance tax payments are paid semi-annually or quarterly depending on the amount of the last known tax liability. Czech and foreign legal entities, as well as natural persons engaged in business activities in the Czech Republic, can apply for investment incentives. The supported areas include: manufacturing industry, technology centres (R&D) and business support services centres. It is very important for the statutory body to act with due care and diligence when performing their role in a company. If the statutory body fails to comply with due care and diligence, it is liable for damages sustained by a company. Unfortunately, the liability could not be limited in any way (for example by an agreement with a company etc.). In order to protect the statutory bodies, insurance companies in the Czech Republic provide a commercial insurance option, meant to insure against damages caused by the decisions of statutory bodies. Contact our experts in the Czech Republic!